TITAN Brings More Than Four Decades of Experience to Nashville. Hiring a contractor for any type of residential or commercial project comes with its own set of potential risks. Even when a provider is referred to you by someone you trust, things don't always go as planned. Does the contractor have the expertise to do the job right? Will the project get done on time and within a reasonable budget? Is the company professional, dependable and honest? Is the work guaranteed? With TITAN Tree & Landscape, the answer to all these questions is a resounding "Yes!" TITAN got its start as a family business in Cleveland, Ohio, more than 40 years ago. In mid-2011, second generation owner Ben Nakon moved his home and business to Franklin to serve Nashville and its communities, bringing with him an extensive portfolio of success stories and content customers. 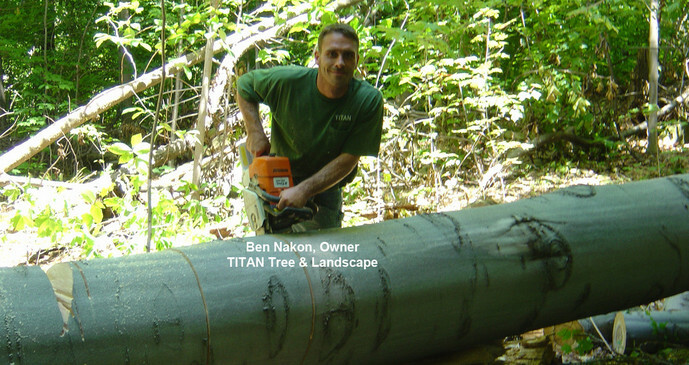 Ben has been in the industry for more than two decades and continues to work in the field as a well-recognized, highly sought tree, firewood and landscape expert. He also manages the operations, sales and service aspects of the business. TITAN specializes in Nashville tree care services, firewood sales in Nashville and landscape design and maintenance for Nashville homes and businesses. Total customer satisfaction is always our top priority. It's the reason we've outlasted our competitors all these years. So, if quality, reliability and integrity are as essential for your project as they are to our business, then call us today at 615-877-5050 for more information and a free estimate. Contact TITAN Tree & Landscape for tree services in Nashville, firewood for sale in Nashville and landscaping design services in Nashville. We also serve Nashville's surrounding communities!